iPod Shuffle, iPod Nano, iPod 5G/4G Touch, iPod Classic are the most advanced and portable digital media devices available from Apple in various models with an impressive and hi-tech features and specifications which includes 5-MP Camera, HD video recording, FaceTime, Apple's Siri, A5 Chipset, Retina Display and various documents viewing options, gaming, videos, music, apps supports from Apple Store etc. etc. 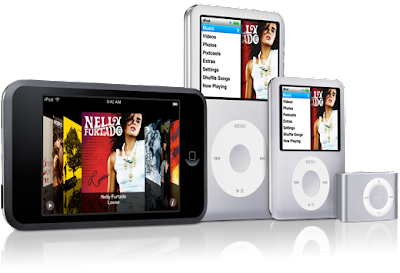 So if you're thinking to buy any Apple's iPod Models including iPod Shuffle, iPod Nano, iPod 5G/4G Touch, iPod Classic device than you must check out following Detailed Comparison Chart of Apple iPod Shuffle Vs. iPod Nano Vs. iPod 5G/4G Touch Vs. iPod Classic Features, Specs, Price, Software & Hardware available below which will provides you an insight details and information about product and also helps you to choose the better iPod model device according to your needs.